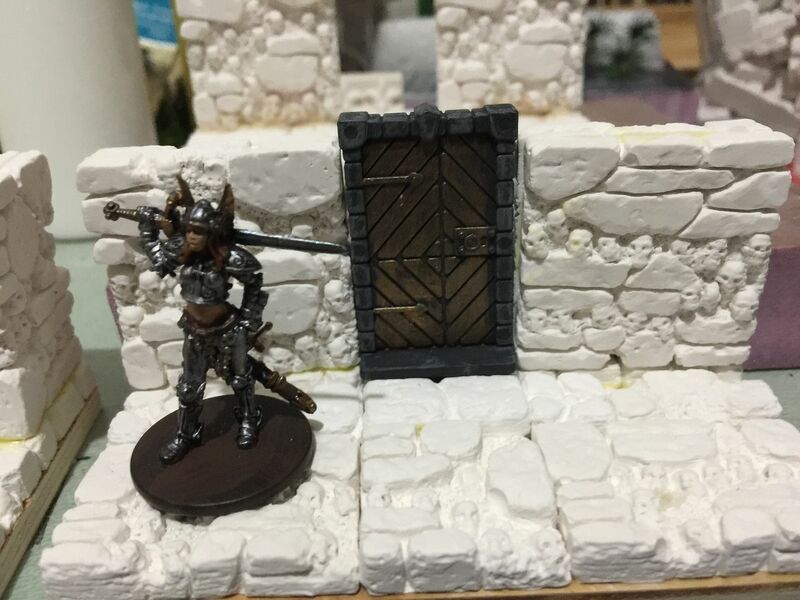 Re: Are the Classic Dungeon Resin Sets gone for good? As i understand it, they have to order resin sets at least a year in advance. Dwarvenite restock orders are like six to eight months. From what i can tell, most of the "preorder" they currently do is really just reserving a set that has already been ordered. Which may be why they sell out of pre orders. Hope to get lucky with the lottery. 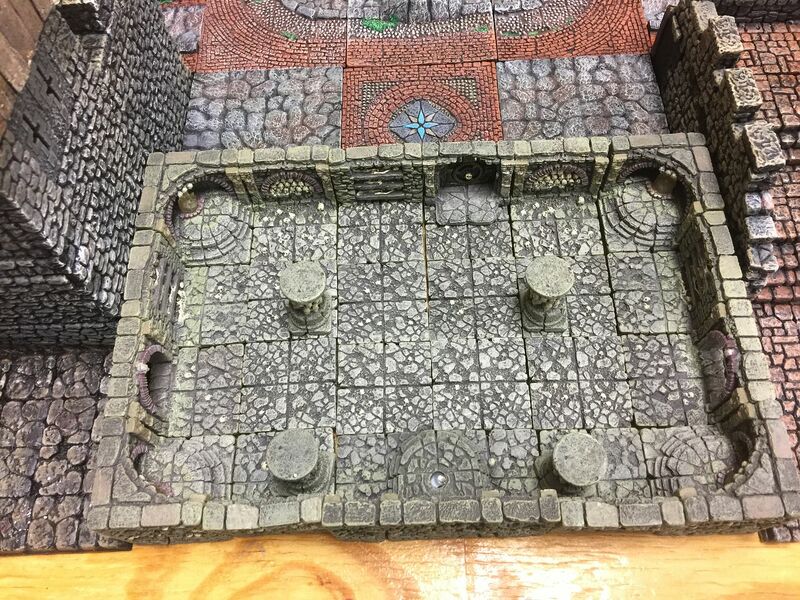 Also, I’m sure this has been discussed many times, but has Dwarven Forge considered a preorder system for the old resin sets? Or maybe they already do this, I’ve seen it on a few items, but not others. It’s crazy how much people are paying for sets like the rivers and lakes on eBay, and I just wish that money was going to DF. Current bid for a river set is a cool $725. As to the resin lake sets... they have not been sold yet. The latest we heard is they are planning to offer the sets for sale through a lottery. Details will be forthcoming. Rumor has it that these lake sets are old stock that were found at the factory in China and forwarded... which is why there are only a very few of them. They have not done another production run. From what we have heard they do not intend to do any additional production runs of the resin lake/river sets due to quality issues (separation of the layers of resin). We are expecting the other resin sets listed in the restock list to become available in September. So, very late to the party, but did the “only a few” resin lake sets already hit the store in early June? Hoping against hope that they are coming with the rest of the restock? Nope, they have not done them yet. Supposed to be a lottery to determine who gets the opportunity to purchase. Yep, I'd go for a couple cavern river sets for sure. That would do it for my resin wish list. Maybe, but unsure what the white squares are. Doors and/or windows I'm guessing. So probably close to the quantity needed for that. I don't own any Den of Evil, either types. Still hunting down some if the price works for me. The bricks would work well for a RotA mix, not sure if I'm a good enough painter for that though. Let us know what's coming from CMON... I don't go on that site much. I haven't played any of the CMON games, I just get some of them for the minis. I really have not played any game(s) [but Cribbage] in 14 or 15 years. All of the Zombicide group of games can be played solo. 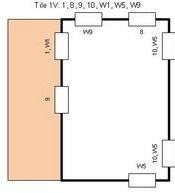 The white squares are the possible location of doors for tile IV. 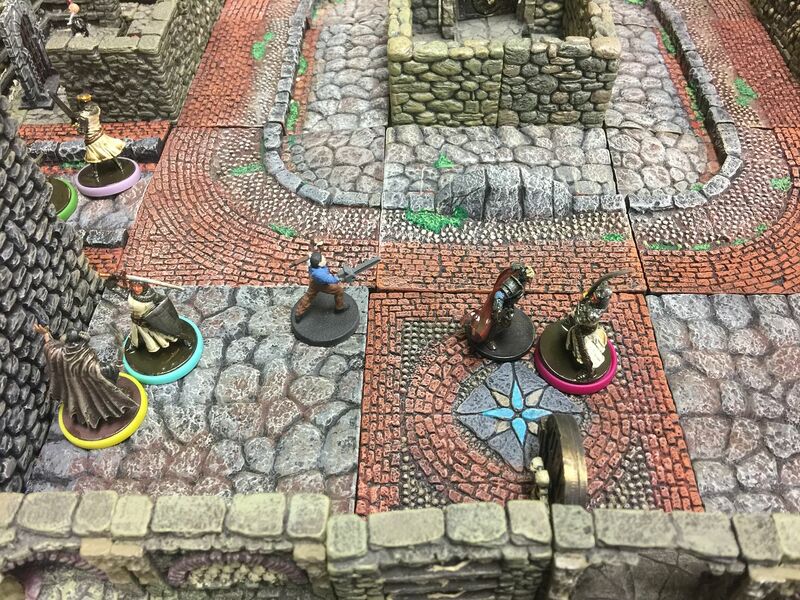 The Zombicide game tiles are printed maps so the doors are placed per scenario. I created a few special tiles so the presentations would look better. The center door is an example.When I finish the shelfs I will post some new photos. I may try to find enough Den of evil to try the IV tile. If comparing to KS-1 walls, I COMPLETELY agree. The texture won't match even if you work out the perfect color. 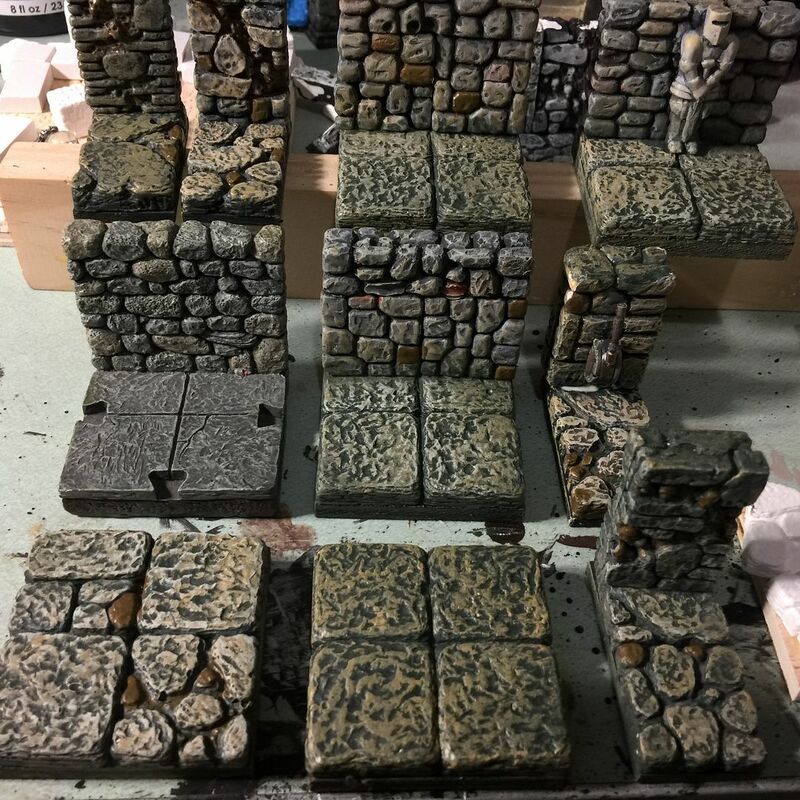 I made the tiles in the photo to transition Master Maze with Catacombs.The texture of the Hirst Arts block floor cast is different enough so that perfect is not ever going to happen.The Texture of the Master Maze and the Chatacome floor tile is a very different style. By combing cast from 4Bot and Hirst Arts various floor molds I can make better looking transitions. You might try painting the floors to match Master Maze and the walls to blend with Realm of the Ancients. Throw in a few brick side walk tiles from City Builder. Remember the City Builder Streets are Roman style. Ash,Tim and the King of the Britons face off against the Bad Ash and the Evil Dead. 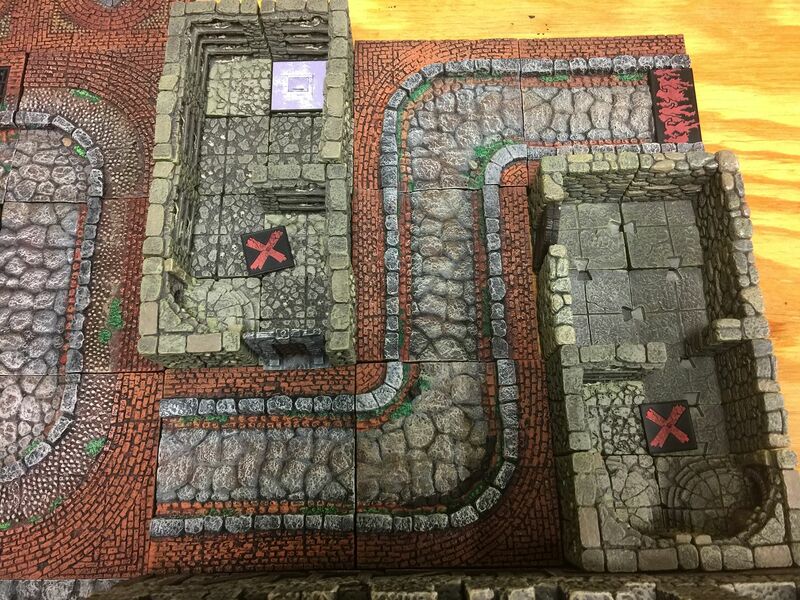 I have the ally dead ends and enough catacomb tiles to make the sections for this scenario now. The Photo illustrates that not all of the sets are painted the same and that transition tiles are desirable. 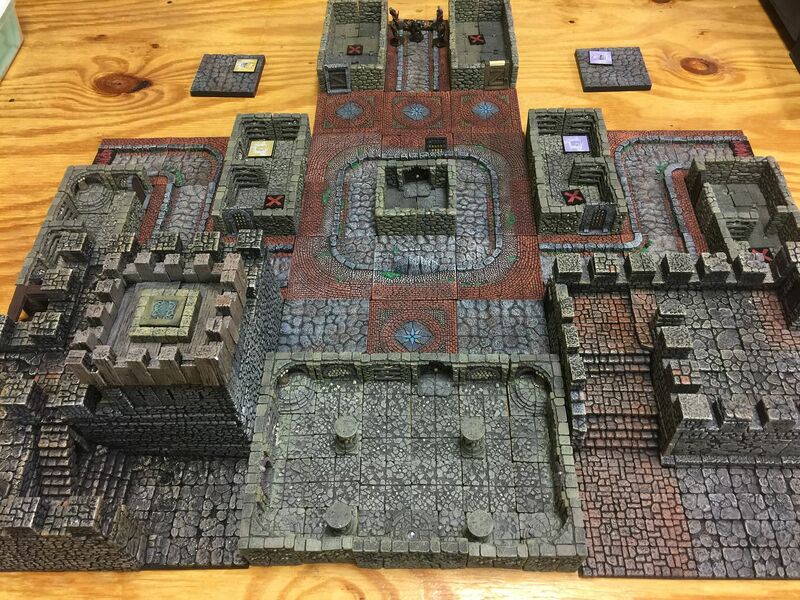 When my new tiles arrive I am going to re do this lay out with a Conan theme. The snake temple will replace the Catacombs . I will do something with the mountain sets to re theme the Woulfsburge towers. William,Your new elevation blocks and the basalt columns would make a good substitute for the Wolfsburg towers as well.